How can I reuse or recycle Stax potato chip cans? | How can I recycle this? Would love ideas to reuse the Stax potato chip cans. 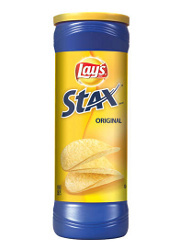 We don’t have Stax over here in the UK but my friend Google tells me they’re like Pringles, but packed in a plastic tube instead of waxed cardboard. Some of the Pringles ideas will still apply: they’re great for storing knitting needles and paintbrushes, can be used as storage for homemade biscuits, and is useful as a small poster tube – for either storing documents without creasing or sending through the post. 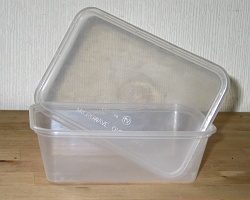 As these bad buys are plastic (rather than card) so water-resistant, they will lend themselves to other reuses too – I’d imagine they could easily be turned into a bird feeder (cut a couple of feeding windows about a third/half of the way up, add a perch at the bottom then fill with seed), could be used for storing dried goods in the kitchen or as storage for small kids’ toys (eg lego or jigsaw pieces) or crayons. My first thought is that it looks like a Shake and Vac* ‘bottle’ so maybe if the lid could be secured it could be used for something like that (with a homemade version of Shake and Vac naturally!) Also it would make a useful storage tube for powders under the sink. Our sink leaked and the things stored in cardboard boxes under the sink were ruined whereas the thing in plastic boxes survived. *Shake and Vac is a perfumed powder from the UK that is sprinkled onto the carpet and left for 15 mins or so before being sucked up by the hoover. Cut a slit in the lid, decorate the container, and have a coin bank. Cut the container so as to have one flat piece, and flatten it out-roll it up the other way a bit, maybe put it under something heavy. Then cut it into strips to be used as plant markers-write on them with a sharpie. Or make bookmarks, punch a hole in one end and add a tassle. Or cut the container across-if the diameter is right for your wrist, make bangle bracelets. Cover them with a strip of fabric to look spiffy and also be more comfortable. Or back to the flat piece-cut out shapes, punch a hole, make a mobile. The blue lends itself to birdies, doesn’t it? You could also cover the cut outs with paper or fabric. 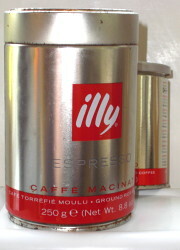 I dislike those cans – they are number 7 plastic and can’t be recycled anywhere that I can find! Anyway, like many plastic containers, it can be reused for food, maybe cookies, cut into rings to use as bracelet or napkin ring blanks, or covered with knit fabric for a planter or vase. Sorry, but I read here in Ontario Canada where we bought ours that they are A10 which is recyclable in our blue boxes for the curb. I love the idea of the knitting needles, because my wife has been hoarding cans for that purpose. I have also started using them for long screws and pretty much anything long and narrow. Collect enough to make a bowling game for kids. Remove label, use permanent marker to number or decorate, perhaps weight with sand, glue on lid and let the kids go at it with a small/medium rubber ball or a used tennis ball. Remove lid, add buttons or pebbles in varying amounts, glue on lid and the kids have ‘musical’ instruments – to be played outside! I love the bird feeder idea. I am personally using a bunch of these to house my collection of those huge souvenir pencils. I never knew what to do with them … I NEVER thought of using them in the post! Can you really just stick an address and a return address with a stamp on it… just like that??! I like the idea of using them in the post. I might use those containers in the garage to organize all those left over nuts, bolts, screws, etc. Just add a label to it. Wow, wish I had a few of those for my wedding. Use them as vases: put some rocks or brick pieces on the bottom to give them stability. I would use them to sore open packages of spaghetti or other long pastas. we have a small table by our door where we like to light incense and I have a vase there that holds all the stick incense, you could use one of the canisters for that too. You could get rid of the label and have your kids decorate it and use if for a pencil box. General food saver container for bits of cereal, pr crackers, all you need to do is stick a piece of masking tape on it and label it. You can also use it to bring foods to potlucks. I always try to use containers that I won’t cry over losing. So I tend to use re-washed grocery store containers or food containers instead of my nice serving bowls and dishes. They can be used during camping trips for storing dry food goods, waterproofing documents or fire starting items, storing silverware, or even used to collect water. I found using empty plastic tube boosts the sound of my cellphone with no hassle no cutting just drop phone in without the lid and voila! They are great for holding dining utensils. I bought my Stax years ago and still use it as a kind of knife-fork and spoon “drawer” at the table.